Amazon’s Alexa voice assistant will be now available for use by third parties. The great thing is that it’s free of charge. With this announcement of Amazon last week, developers can start integrating it into their own software or devices. Alexa Voice Service (AVS) is a collection of support documents, sample code, and APIs that can help you get started on combining the program into your own software or device. Developers can add it to their own devices or programs within a few hours. Amazon added that there’s no specific training or education that you need to help you in integrating it to your own creation. That said, you can use it even without knowledge of natural language processing. However, if you wish to add more functionalities or features to your devices and/software, you may start using its Kit. It’s also free of charge. When you add it to your device, your users can request information or certain details about something. They’ll receive the information they’ve requested in the same manner as they would using an Amazon Echo. What this means to your user? They can ask about the weather or get about their math problems. AVS can also ask facts about the famous celebrities or individuals, dates, as well as places. They can also use it to play or buy music from Amazon Music or utilize it to explore Prime Muisc. If they want to lighten up their mood, they can listen to jokes and/or play Simon Says. They can also get traffic updates during their daily commute or check the weather to where they’re heading or other locations in the world. Plus, they can easily check their appointments they’ve set up in Google Calendar through Alexa Voice Service integrated into your devices/software. Developers who have already tried the service did find the technology to be great in understanding the language. But there were flaws they’ve seen or experienced during their review. It may not be perfect, yet, but it does live up to Amazon’s promise that it can understand organic speech. This means that your users can talk to the assistant easily without having to learn certain verbal commands. Hardware makers can finally test how a language power or assistant can boost their projects. 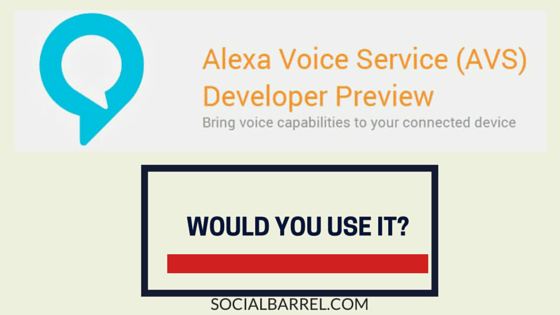 Alexa Voice Service is in its developer preview yet. It’s not a polished version. What this means to you and other developers is that you can’t launch yet new features based on that service. Hardware makers are still waiting for Amazon to finally flip that switch. Despite that, this is a new progress for Echo or the voice technology of Amazon. Developers can already start using the technology for their own connected products. They can easily work with it and the resources included. For now, the assistant is getting great reviews from developers and hardware makers. Most of them are failing in love with the assistant’s capability of understanding natural language. And because it’s free, it wouldn’t be a surprise to see this technology to be popping up and used in more devices and software.